Fire will spark your interest and light a flame in your heart. 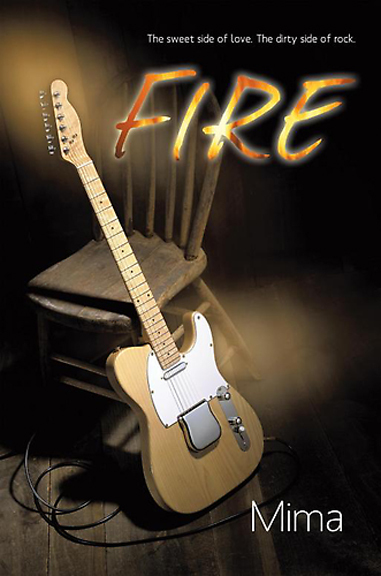 The fictional novel written by Mima follows a band called Fire as they set out to make a name for themselves in the music industry. The book is set in Ontario in the 90s, and references real life events that marked the decade, like the suicide of Kurt Cobain, Sinead O’Connor’s stunt on Saturday Night Live and the OJ Simpson trial. It’s details like that, and the complete unpredictability of the plot that carry the story and blur the lines between reality and fiction, allowing readers to easily fall into the novel. Fire isn’t all about music: it takes a romantic love story, and balances it out with the raunchiness of the drug and party scene that often shadows rock bands. And it has a little bit of everything, including humour and suspense, and succeeds in capturing the everyday challenges of life, and not just the challenges faced by up-and-coming rock stars. The book follows band members Tarah, William, Jimmy, Michael and Eddie as they navigate the industry and its temptations, relationships and both the upside and downside of success. The cast of characters in the band and the rest of the book are all unique, flawed in the sense that they’re real and thus relatable to readers, and well-developed, dynamic and multi-dimensional. As a student who barely has any time to read course textbooks and generally prefers to read non-fiction, I found myself making time to read Fire, and genuinely enjoyed the read. Overall, it was a solid and enjoyable book that provided a refreshing change of pace from the vampire fantasy love sagas found in every book store and all over TV.